27th September 2017. New SR and FEC. Now 22000 2/3. Before 23500 3/4. Since 28/09/2017. Time-sharing with TV Mainfranken. Since 4/12/2017. Time-sharing with Main.tv. HDSince 4 December 2017. Former name TV Touring. News public channel offering news bulletins every 15 minutes from 9:00 to 19:00 with special sections such as “Deutschland & Europa” or “Welt und Politik”. Formerly known as ARD Einsextra, rebranded in May 2012 to tagesschau24. Public channel offering mainly music, films and documentaries. Until 4th September 2016 Einsfestival. French-German cultural channel edited by a French-German trust consisting of ARTE France and ARTE Deutschland GmbH. The central office of ARTE is located in Strasbourg. ARTE, Association Relative à la Télévision Européenne. Public culture and documentary channel. The channel is operated by ARD and ZDF. Since 13th September 2017 Bobbles TV Indian channels on this transponder. SR: 23500 KS/s. HDRegional public channel. Berlin and Brandenburg. “Third ARD channel” in this region. HDRegional public channel. Länder Sachsen, Sachsen-Anhalt and Thüringen. “Third ARD channel” in this region. HDRegional public channel. Land Hessen. “Third ARD channel” in this region. HDNews public channel offering news bulletins every 15 minutes from 9:00 to 19:00 with special sections such as “Deutschland & Europa” or “Welt und Politik”. Formerly known as ARD Einsextra, rebranded in May 2012 to tagesschau24. HDPublic channel offering mainly music, films and documentaries. Until 4th September 2016 Einsfestival. HDCultural television channel. Formerly BR Alpha. HDRegional public channel. Saarland. “Third ARD channel” in this region. HDBBC's international news television channel. HDCatholic and Protestant Christian television channel. Television channel of the Seventh-day Adventist Church. News public channel. News bulletins every 30 minutes. Christian television channel (of Ukrainian origin?) in German. HDPublic cultural channel. It is jointly operated by ARD (Germany), ZDF (Germany), ORF (Austria) and SRG (Switzerland). Public children's channel. Jointly operated by ARD and ZDF. HDPublic channel targetting younger adult age group with Factual Entertainment: Documentaries, music programmes, films, international TV series and comedies. Formerly ZDF Dokukanal, rebranded November 2009. HDPan–Latin American satellite television channel from Caracas, Venezuela. Private television channel targetting young audience. National public television first channel. Das Erste, "The First". HDFrench-German cultural channel edited by a French-German trust consisting of ARTE France and ARTE Deutschland GmbH. The central office of ARTE is located in Strasbourg. ARTE, Association Relative à la Télévision Européenne. 27th September 2017. New modulation, SR and FEC: DVB-S2 8PSK, 22000 et 2/3. Before DVB-S2X QPSK 25500 y 11/20. HDPublic culture and documentary channel. The channel is operated by ARD and ZDF. Regional public channel. Land Hessen. “Third ARD channel” in this region. Public cultural channel. It is jointly operated by ARD (Germany), ZDF (Germany), ORF (Austria) and SRG (Switzerland). Public channel targetting younger adult age group with Factual Entertainment: Documentaries, music programmes, films, international TV series and comedies. Formerly ZDF Dokukanal, rebranded November 2009. Regional public channel. Berlin and Brandenburg. “Third ARD channel” in this region. Regional public channel. Länder Sachsen, Sachsen-Anhalt and Thüringen. “Third ARD channel” in this region. Time-sharing. Comedy 17h-6h. Since 1/01/2019 only Comedy. 4 July 2017. New modulation and FEC. Now DVB-S2 8PSK and 2/3. Before DVB-S2 QPSK and 2/3. Television news channel by RTL Group. Regional public channel. Saarland. “Third ARD channel” in this region. Cultural television channel. Formerly BR Alpha. 10th January 2019. FEC and modulation change from 9/10 DVB-S2 QPSK to 3/4 DVB-S2 8PSK. Since 1/11/2018. Time-sharing with Baden TV Süd. Left 5/11/2018. Back since 10/11/2018. Since 01/11/2018. Time-sharing with Baden TV. Left 5/11/2018. Back since 10/11/2018. Catholic and Protestant Christian television channel. Volksmusiksender. Obwohl es sich um einen österreichischen Sender handelt, wird aus der slowenischen Hauptstadt Ljubljana gesendet. If you get BBC One, BBC Two and son on, that's because the dish is aligned to 28.2º East Astra 2, not to 19.2º East Astra 1. Apparently nothing has changed with your receiver nor the dish and LNB, but you can not be sure. There are also the LNB-receiver connection issues (cable, distance, couplers, splitters...) and the obstacles between the satellite and the dish (like trees, buildings, awnings...). You can check the receiver's signal level and quality indicators on the desired transponders. 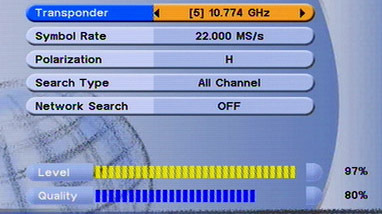 the Astra 19.2 E is possible in UAE...and what size dish I need for it..thank you so much..
We try to update several times a week. I live on the north side of Tenerife and with Astra 19 can get BBC world, CNN, CNBC etc., butg not itv or other bbc channels. Is there a french channel available on this satellite on which to watch the RWC cup final today, 31 october? I live near Limoux in the Aude S o France, I have just had a dish etc installed for TNT but when ever it is windy I lose the signal on all channels and get a message on screen to say that the dish needs adjusting. Is it likely that the wind does this? or has the dish been incorrectly set up. Can anyone give me the info I require elevation, azimuth etc I need to check where the dish should be pointing. I live in Austria and used to see Arte in French and sometimes in German, a few days ago I lost the french signal and I cannot find the informations about transponder, frequency, symbol rate etc. Could you communicate? The german Arte in the contrary is working well. Hello everyone. I`m here to ask you something. My SMART TV has option to add another satellite in the menu and I can search it˙s channels. Now I´m wondering, can I add Astra 19.2 satellite on my menu and search for it if my tv automatically chooses eutelsat 16A 16E, because I have that option but when i connected my satellite dish, it randomly chosed eutelsat and now i am in doubt. Now I want professional opinion of the Masters!! Thank you very much and sorry for my english. Thank you again! (I am living in the east side of Croatia). Hello I live in Saudi Arabia, can i get connected to franch chanel (well, yes am French!!) What equipment should i get? And my wife is Thai, so if you have info on how to get Thai tv, this would be much appreciated... In advance many thanks for your info and help. Can Eurosport 2 be received at 19.2¤E? Yes, but encrypted. • 11171 H Eurosport 2 HD: Sky Deutschland. • 11686 V EUROSPORT 2 SD: Movistar Plus (Spain). • 12090 V EUROSPORT 2 HD: CanalSat (France). • 12515 H Eurosport2 ger SD: AustriaSat, Canal Digitaal (Netherlands), TV Vlaanderen (Belgium), Mobistar (Belgium). Is it possible to receive Astra 19.2 in south africa? I have smart uhd television from Germany with lnb input in Nigeria. Africa. Is it possible to receive Astra 19.2 signals? What size of dish and LNB type would i need ? Kind Regards Osa. Are there any channels that ARE FREE from South Africa? Hi, why there is no more Dw in english, nor Euronews in English, nor Aljazzeira in english, since few weeks ago. Hi, I have a FreeSat Receiver and trying to add some Free to air channels. I live in the UK and want to watch some Russian channels. Unfortunately, it would not allow me as it says the channels are not found. I guess, I need to switch the FreeSat receiver toa Free to Air Receiver? Apparently you have a multi satellite dish. • Astra 1 19,2º East: BBC World News Europe HD... • Astra 2 28,2º East: BBC, ITV, Channel 4, Five channels... Search on both satellites with correct DiSEqC settings. Just to say this is a really useful site. Since loss of Astra 2 Freesat channels (I am in Spain, S of Barcelona), I reoriented my 80cm antenna to Astra 1 19.2E and can now receive any of the Ku-band channels you list. It's mostly German stuff, but quite a lot of English language international news channels, particularly BBC World News. I have a Humax Freesat box, so use the Manual Tune to get the channels. It is a bit of a rigmarole to set them up, but fine once they are programmed in. I am writing a wee guide for this, if anybody interested. sir.I am here in bahrain i need to tracking astra 19e. may possible here? how size dish need to track? I need to know which sats with FTA channels can I receive in Spain. Just one or few web links will be appreciated. Thanks in advance. What channels for free can I have in Basque Country from Astra satelite? I receive well the picture of 5 channels at Astra 1N -11954 H 27500 FTA, but no sound at any. All other channels received at Astra 1 have sound. Parabol 1.2 and Lnb 0.2 living in France. I have downloaded it several times, but no change. What can I do to change the problem? Thanks in advance. Have you tried all audio tracks ? I live in Whitehorse, Yukon, Canada, is it possible to pouint a dish to an european satellite to receive german tv? do you known where i can buy a decoder or a satellite viewing card for all channels on Astra 19.2 east.thank you John.